Google's biggest partners in the Android Wear game are playing it safe heading into the busiest shopping time of the year. LG, Huawei and Motorola won't be releasing new smartwatches for this holiday season, CNET has learned. LG is the only one to have released a new Android Wear smartwatch this year, the LG Watch Urbane 2nd Edition LTE. Since that's the case, Apple and Samsung are left to dominate smartwatch sales this holiday. Apple just announced its updated Apple Watch Series 2, which focuses on fitness, and dropped the price of the original Apple Watch. Samsung also recently released its Gear S3, running the company's own Tizen operating system. Android smartwatch makers were expected to announce new smartwatches during September's IFA trade show, but Asus was the only company that released a new Android Wear watch, the ZenWatch 3. Smartwatch sales have been in decline for some time now, and wearable makers are now focusing heavily on fitness and fashion. Apple's iPhone 7 and Apple Watch Series 2 keynote showed off all the fitness-focused features of the new watch, including its new waterproof design. 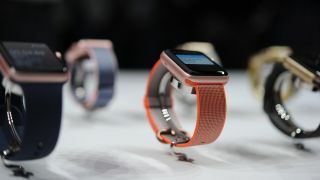 The company even partnered with Nike to release the Apple Watch Nike+, aimed at athletes with its brightly colored fluoroelastomer straps. The new Apple Watch Nike+. Asus went back to the drawing board with its ZenWatch 3 design and created its most attractive smartwatch yet. It features a flashy two-tone design and comes in rose gold, silver and gray. Other smartwatch manufacturers like Garmin, Pebble and Casio are going all-in on fitness and fashion. Garmin's fashionable and expensive Fenix Chronos feature GPS, heart-rate monitoring, a pedometer, altimeter, barometer and compass. Pebble recently released a fitness-focused update for its smartwatches. With smartwatch demand not quite what manufacturers hoped for, it's not surprising that LG, Motorola and Huawei would be treading carefully. "We want to see what sticks," said LG spokesman Ken Hong, speaking with CNET. The LG Watch Urbane 2nd Edition will let the firm know if users want a more feature-packed smartwatch that can be untethered from a phone. The LG Watch Urbane 2nd Edition sports a LTE radio so you can use it without your phone. "One of the things we see in the future is connected [cellular] watches, and our opinion is that while it's technically feasible, the trade-offs on the product itself means we're not quite ready yet," said a spokeswoman for Motorola. Putting more radios and features into a smartwatch requires more room, which is why the new Samsung Gear S3 is a whopping 46mm in diameter, up from the 40mm and 42mm sizes of the Gear S2. This holiday slump doesn't mean there's no hope for Android Wear. Google is slated to release its Android Wear 2.0 update this fall, which should help reinvigorate smartwatch interest. Chip manufacturer Qualcomm also released its wearable-focused processors earlier this year, which will help improve battery life and performance for future smartwatches.